The Unknown Merit (知らざれる功?, lit. : "Unknown Merit") is a treasure found in Pikmin 2. 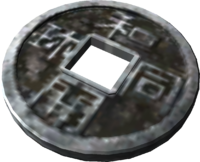 It is actually a wadōkaichin coin (和同開珎), which is an old piece of Japanese currency. It is found in sublevel 4 of the Bulblax Kingdom inside the body of a Wollywog that falls from the sky. There are electrical wires nearby that may hinder progress. The Unknown Merit being analyzed. A real world wadōkaichin coin. This page was last edited on December 4, 2018, at 04:04.